Eddy current sensor design for greater accuracy with built in temperature compensation, no need to zero the sensor. Single sensor for all depth ranges. Separate sensor and main instrumentation unit to scan difficult to access area's. Locates rebar, post tension cable, conduit,and copper pipe. Rugged and splash resistant case. Daylight visible display. Optional Scan Cart logs distance data as well as the location of rebar. Locates up to 8" (200 mm) deep. Determines bar size up to 4.5" (115 mm) deep. Conforms to ACI 318, BS 1881 Part 204, DIN 1045, CP 110, EC 2, SIA< 162, DGZfP B2. 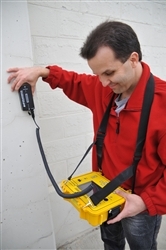 The James Rebarscope® is the digital version of a classic rebar locator, rebar finder which enables the user to not only locate reinforcement bars but also determine rebar depth and the rebar size. 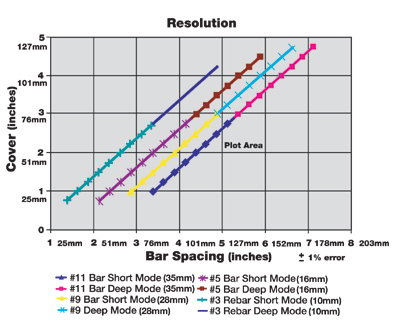 The Rebarscope® rebar locator is also capable of locating non ferrous metals as well such as copper, aluminium, some stainless steels, wire, and more! The eddy current sensor is specifically designed to react to the outer surface of the metal object. It is uninfluenced by small metal particles in the concrete, whether the concrete is fresh or hardened, wet, or dry. The eddy current sensor also allows the unit to locate both ferrous as well as non-ferrous metals in concrete and other non-metallic construction materials. This sensor has also been designed with temperature compensation circuitry as well. The temperature compensation circuitry not only improves accuracy and performance but allows the operator to use the equipment without a "zero" procedure first. As always only one sensor is required for all depth ranges and functions of the equipment. The latest in microprocessor technology not only conditions the signal from the sensor for more accurate and dependable results but provides the user with the information they need. 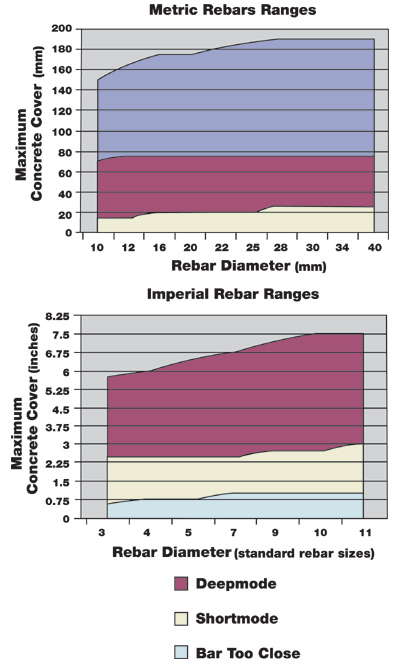 Rebar diameter can be estimated by using a simple system of comparison. All this is fully automated for consistent, repeatable results with increased resolution over previous models. The microprocessor can also statistically analyze the data, searching automatically for minimum cover points, and the least cover of a group of points. A Cover Map or display of cover points as a symbolic map of a structure can assist the user in finding problematic areas. Built in memory can store over 80 thousand individual data points for later processing. Feedback to the user can also be made via the direct view, sunlight readable digital screen, or via head phones. By seperating the sensor from the main instrumentation unit, difficult to reach area's can be handled with ease. Rebarscope® used on Wall with Scan Cart Rebarscope® with Scan Cart Rebarscope® with P.C. The optional Scan Cart can be used to graphically display a cross section of the concrete and the location of the metal objects within. With its built in encoder objects can be located with both distance and depth recorded. Rebarlinx® the fully integrated P.C. software allows the upload and storage of data points via USB. 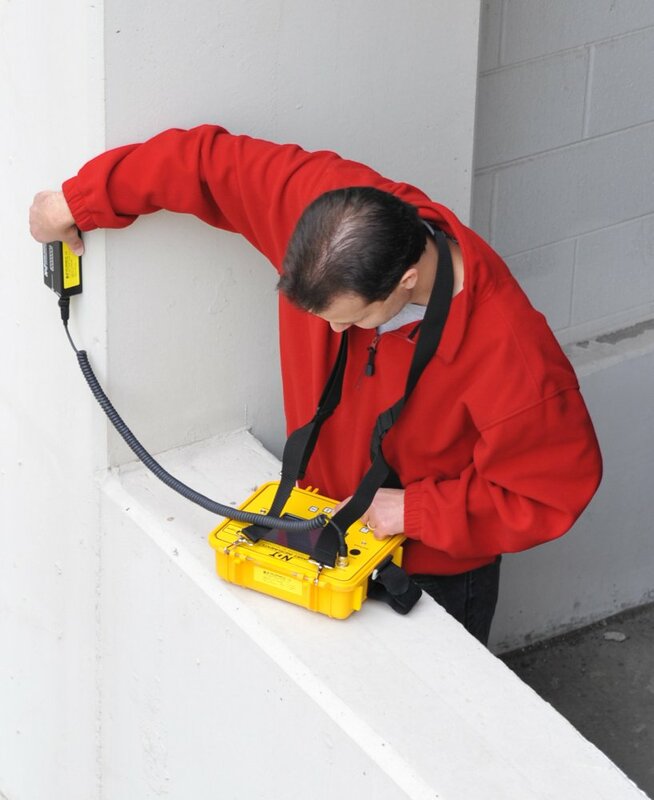 The ruggedized Rebarscope® provides the field engineer/technician with all the tools necessary to locate and determine what and where all metal objects are within the structure. R-C-450 BASIC UNIT WITH SOFTWARE includes the following: Main Unit, Probe, 8 ft Cable, Sizing Template, Charger, Headphones, USB Cable, and Basic Software. R-C-475 SCAN CART UPGRADE includes the following: Scan Cart, 2 Extension Rods, 12 ft Cable, Scanning Software. Turns your Basic Unit into a complete system (R-C-410).